The three star Mercure Farnham Bush Hotel has a great central location in Farnham. Set in its own beautiful gardens and offers 94-bedrooms in this historic building. With easy access to the M3 motorway and Farnham train station this hotel is perfect for business or leisure. Farnham is close to Guildford, Winchester and Farnborough Airport, with London Heathrow Airport around 51 km from the hotel. 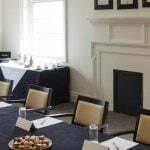 The hotel is ideal for meetings and events and boats a self-contained conference centre with garden views.